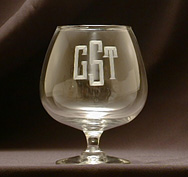 Home > Host & Hostess Gifts > Tabletop > Glassware > Stephen's Glassware Corporation > Brandy Snifter - 22 oz. A wonderful glass the next size up from the 12 oz snifter and still fits neatly in the palm of your hand. An elegant gift when monogrammed. All glassware will be etched in Roman Block or Diamond font. The Diamond font must be a monogram with the last name initial larger and in the center. The Roman Block font can be used as a monogram (last initial in center) or with initials in order (first, middle, last) or when writing out a name.